Which Size Fits my Car? Both sizes 11 and 15 will fit. Size 11 fits best. Size 15 may be noisy in some cars. Size 11 may be noisy in some cars. Size 15 does not fit. Neither size 11 nor 15 is recommended. The RoofBag Cross Country carrier is 100% waterproof and offers the best weather protection and durability in the market. No exposed stitching and 2-year warranty means peace of mind even for the longest trip in the most severe weather. Size 11 fits all vehicles - Same storage space as 4 medium-size suitcases. 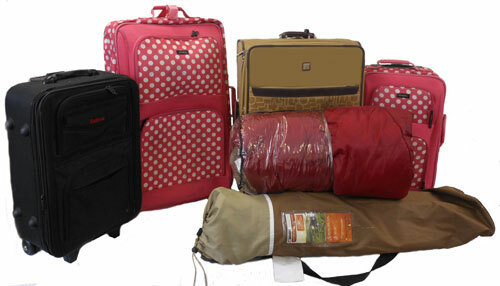 Size 15 fits full-size sedans, SUVs and vans - Equivalent to 5 medium-size suitcases. Choose Rack if you have side rails, cross bars, or basket. Choose No Rack if you have a bare roof (no rack) or flush rails. On side rails: straps attach to side rails left-to-right. On cross bars: straps attach to bars front-to-back. On bare roof (no rack): straps pass through the inside of the car through door frame. Doors close over straps. Door Hook Straps provide an alternative way to secure the carrier to the door frame, avoiding the overhead strap. For these straps to fit, the top section of the door frame needs to have a vertical ridge about 1/2" wide x 1/2" high, sticking down from the frame. RoofBag Cross-Country car top carriers are covered with a 2-year warranty against defects in materials and workmanship. Ships the same day if order is placed on a business day (M-F) before 2:45PM PST. How Much Stuff Fits? What are the Dimensions? A RoofBag carrier size 11 holds 11 cubic feet of contents, which is the equivalent of 4 medium-sized suitcases. A RoofBag carrier size 15 holds 15 cubic feet of contents, which is the equivalent of 5 medium-sized suitcases. The 99% waterproof RoofBag Explorer carrier offers excellent weather protection at an economical price and can withstand the severe rigors of travel. RoofBag Explorer car top carriers are covered with a 1-year warranty against defects in materials and workmanship. What's the difference between Cross-Country and Explorer? Cross Country: 100% waterproof, all joints are electrically welded, guaranteed for 2 years. Explorer: 99% waterproof, more economical because the zipper flap is stitched, guaranteed for 1 year. Both car top carriers are the same size and shape, and use the same heavy-duty, waterproof fabric and the same waterproof zipper. What Size Do I Need: 11 or 15? Protects roof, keeps carrier steady, cushions the load. A protective non-slip roof mat that prevents slipping or sliding of the carrier, increasing stability and safety. It also prevents scratches of the roof caused by dirt. 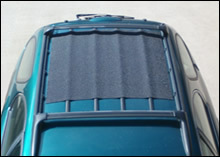 Provides extra padding and protects the roof paint during travel. Strongly recommended for cars without a roof rack. Also recommended for cars with a roof rack. Adds friction between carrier and roof, preventing slipping or sliding. Made of special non-slip, rubbery webbing material, 5/32" thick. Mildew and UV resistant for durability. Help pack, organize, load and unload the carrier with ease. 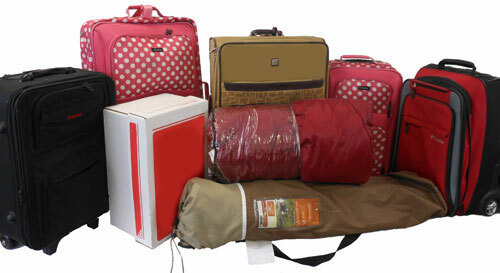 RoofBag Duffle Bags simplify packing, organizing, loading, and unloading of the carrier. They fit snuggly inside the carrier and help keeps its aerodynamic shape for fuel economy. Simplifies organizing, packing, loading, unloading, unpacking, and accessing. When full, helps keep the aerodynamic shape of the car top carrier. Made of rip-proof and water-repellent black polyurethane-coated polyester. Each duffle bag holds up to 50 lbs of gear. Genuine YKK zipper slides smoothly and never jams. A heavy-duty handle on either end makes lifting easy. Not included with carrier. Order separately. Each RoofBag carrier "For Cars With Rack" comes with 2 Straps for Rack that fasten to the rack of the car (side rails or cross bars). Order an extra set of Straps for Rack if car has side rails and cross bars so that you can fasten the carrier to both the side rails and the cross bars. Each RoofBag carrier "For Cars Without Rack" comes with 2 Pass-Through straps that work on cars without rack. Order an extra set of Pass-Through Straps if you have a large van or SUV without rack, so that you can splice straps together to make extra-long straps. Also on a SUV or a 2-door car with a rear gate, extra-long straps allow running the straps through the rear gate. On cars with a curved roof, an extra pass-through strap holding down the front of the carrier will keep the front of the bag from lifting up during travel, for a more quiet ride. Straps with Door Hooks are not included with the carrier because they don't work on every car. These straps offer an optional attachment method by securing carrier to door frame and thus avoiding the pass-through strap which may pass too close to the head of tall drivers in small cars. For these straps to fit, the top section of door frame needs to have a vertical ridge about 1/2" wide x 1/2" high, sticking down from the frame. Stores conveniently your carrier and accessories. Convenient bag to store the RoofBag carrier and accessories when not in use. Fits a RoofBag carrier, straps, protective mat, and 3 duffle bags. Nylon fabric with polyurethane coating for water and mildew resistance. Drawstring and cord lock close for convenient securing and hanging. Easily reach the top of your car, van or SUV. 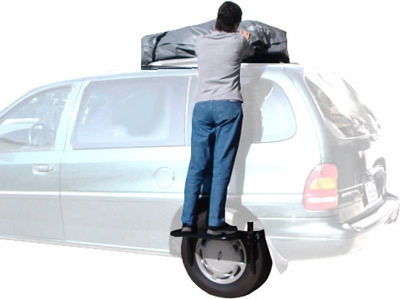 The RoofBag Tire Step solves the problem of having to reach to the top of the car, van or SUV to install a car top carrier or to access its contents during travel. Attaches to tire via heavy-duty polyester strap of adjustable length. Fits any tire: strap length adjusts easily via a spring lever in a cam buckle. Height is also adjustable to fit any type of vehicle. Platform is made of reinforced steel plate for firmness and stability. Frame is heavy-duty steel tubing for strength and durability. Can hold 500 lbs of weight. Platform Dimensions: 22" x 9"
Add security by locking the zipper of your carrier. This high quality, rust-proof, solid brass lock allows you to securely lock the zipper of the RoofBag carrier. It gives you peace of mind when the carrrier is unattended. Attaches easily to the zipper slider holes on RoofBag carriers. Hardened steel shackle protects padlock against cutting. Solid brass body and mechanism makes this padlock rustproof. Expand your car and give your family and friends enough room to pack everything they need. Roof Bag car top carriers are easy and simple to install on cars with or without roof racks. Our car top carrier can be easily switched to different types of vehicles so it is convenient for anyone to use or share. When you buy from RoofBag you receive a top quality car top carrier, at prices that no competitor can match, because you are buying directly from the most experienced manufacturer of soft rooftop carriers in the country. As a matter of fact, RoofBag is the only soft car top carrier company manufacturing its products in the USA. We care about you and your family's safety, that's why we continue to improve our soft car top carrier and accessories. Our soft car top carriers have been perfected for over 20 years and are much easier to install and remove than hard carriers. RoofBag's are constructed with heavy duty waterproof fabric and provide maximum safety with heavy-duty buckles and straps that will never break. Our car top carriers have been custom made to withstand beating by high-speed wind and extreme weather conditions. The straps used in our car top carriers are seat-belt style, 1,000 pounds strong, water-repellent and 1.5 inches wide. Thanks to RoofBag's carriers unique aerodynamic design you will save fuel considerably and enjoy a quiet and pleasant ride. You can also feel reassured about your purchase with our 30-day returns and 2-year warranty policy against defects in materials and workmanship.The best part of using a flexible, soft car top carrier is that once you're done with your trip, you can easily take down the carrier from the roof, fold it into a small package and store it without taking much space. Our family of 5 just traveled over 5,000 miles through heavy wind, rain, sleet and snow with nothing but perfect performance from the RoofBag. Thank goodness for your product! I did much research on car top carriers, looking for one that needed no roof rack. I'm so very happy to have found your site & products!! Just returned from a road trip with my Hubby, oldest DD & two year old Granddaughter. We went from Indianapolis to San Antonio, then on to Las Vegas and back. We used the 15 cu. ft. gray Cross Country carrier with the protective mat on our 2005 Malibu Maxx & it was such a space saver for us!! We packed all of our suitcases, Baby's pack-n-play, stroller, portable highchair, extra diapers, blankies, toys & etc. into the three duffle bags we got. Everything fit nice & snug. The carrier was easy to install & use. We only had to adjust it once during the entire trip. There was no noise & our gas mileage was barely affected by it. As for the waterproof feature, we encountered rain once & it was not a hard rain, but everything stayed nice & dry. It is so awesome to find a product that does all it claims to do! Thank you! We will highly recommend your products to everyone we know! I would highly recommend this bag to anyone looking for a soft sided carrier. We made a last minute decision to purchase the Cross Country Car Top Carrier before leaving on vacation. It was the best decision we could have made. We put two very large suitcases and two carry on size suitcases in the carrier. We rented a beach house so we bagged towels and sheets and tucked them in between the suitcases. I wish I were kidding when I say it rained the entire trip, but I'm not. Rain every single day. We made several other stops to and from our primary destination so the luggage was in the carrier the better part of 7 days. We drove a total of 1,581 miles. Everything in the carrier remained 100% dry, the bag stayed secure with no rips or damage and we got better gas mileage than we have ever gotten with that car so needless to say, we were shocked. 2010 Ford Edge with roof racks and we averaged 35 miles per gallon. Wow! I am currently your biggest fan. Using the bag left me plenty of room inside for all the other necessities. I would highly recommend this bag to anyone looking for a soft sided carrier. One more detail....I called to place the order so I could ask questions...courteous, friendly and very helpful! Thanks for helping us have a successful trip! I am very happy with my purchase. Everywhere else I looked for a car top carrier, I was told that I would need a rack installed on my car. I have a small Nissan Sentra and bought a fully waterproof RoofBag with its protective mat and was able to go over 1000 miles with no problems whatsoever. We were even caught in a hail storm that was so bad it made most of the traffic on the freeway come to a complete stop to wait it out. It lasted 30 minutes or so, and there was no damage whatsoever to either the bag or our belongings.